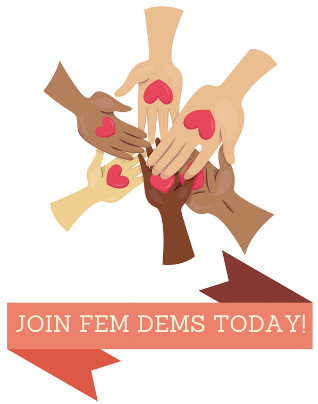 The mission of the Fem Dems of Sacramento is to promote the feminist principles of inclusion, equality, and diversity. We will fight disenfranchisement both within the Democratic Party and the community at large. This will be done by promoting involvement by feminists in the Democratic Party; actively working to elect candidates who share a feminist agenda through volunteerism, fundraising and outreach; and clearly defining “women’s issues” so that candidates, elected representatives and the Party can work toward those goals. We are conscientious activists committed to stimulating advancement of feminist ideals through a combination of social fellowship, community involvement, and political activism. We believe that this process will sculpt future leaders who are committed to feminist principles, thereby positively influencing our community, state and nation. Join us today and sign up here.